On June 3, facial paralysis and Bell's palsy expert Dr. Babak Azizzadeh was featured on NBC, along with author and motivational speaker Mary Jo Buttafuoco, to talk about facial paralysis and their foundation. Twenty years ago, Mary Jo Buttafuoco made headlines when she was shot in the face by her husband's teenage mistress. Today, Buttafuoco is remarried, a published author, and an acknowledged motivational speaker. “I thought nothing could be done, but I was wrong,” says Buttafuoco. Seven years ago, Dr. Azizzadeh changed her appearance. “We ended up doing a complex surgical procedure to adjust her smile, face, and overall appearance. I do a lot of aesthetic surgery and use a lot of those tools in helping patients who require reconstructive surgery,” says Dr. Azizzadeh. While Dr. Azizzadeh has transformed the faces of many, not just in Beverly Hills but in third world countries, he felt like something was missing. “There was no foundation that really addressed the needs of patients with facial paralysis, which is why we decided to team up and create the Facial Paralysis & Bell's Palsy Foundation,” says Dr. Azizzadeh. The members of the Facial Paralysis and Bell's Palsy Foundation meet bi-monthly to talk about the latest treatments, research, and to share their stories. “I help others the way I know how to. I cannot use a scalpel, but I have my voice,” says Buttafuoco. The Facial Paralysis & Bell's Palsy Foundation was founded in 2008 with the desire to provide a network of information, education, and support to people who are suffering from Bell's palsy and permanent facial paralysis. The foundation actively supports ongoing research within the medical community to find and advance new and improved treatments for facial paralysis. Mary Jo Buttafuoco is a New York Times bestselling author and a motivational speaker. Mary Jo has been featured on Fox Friends, Good Morning America, the Oprah Winfrey Show, the View, and several other major media outlets. Dr. Azizzadeh is trained in Facial Plastic & Reconstructive Surgery, as well as Head & Neck Surgery, giving him a distinctive insight into facial nerve function and facial aesthetics. He has been recognized for his work on several occasions, and has appeared on the Oprah Winfrey Show for his expertise in facial nerve reconstruction. 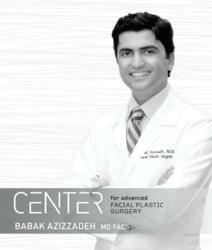 Dr. Azizzadeh is also the director of the USC Facial Plastic Fellowship Program as well as the Cedars-Sinai Multispecialty Plastic Surgery Symposium. For more information visit http://www.FacialParalysisInstitute.com/foundation or call (310) 657-2203.